The festival of Diwali is no longer a festival of joy alone and is accompanied by misery especially for those suffering from breathing disorders. This is true for the entire NCT of Delhi, which has an alarming population of over 20 million people. Every year during Diwali, the air quality worsens and is worst during and immediately after the Diwali night. The large-scale burning of fire crackers during the Diwali night, which spikes up the already air polluted National Capital is the principal cause of this pollution. This year, the Government of NCT of Delhi has taken significant steps for ensuring the reduction of air pollution due to Diwali. The Government began with writing a letter to all the schools, through its Eco Clubs Scheme. The Deputy Chief Minister of Delhi Shri Manish Sisodia, urged the over 2,000 Eco Clubs in different schools of Delhi and urged them to spearhead the ongoing Say No to Firecrackers Campaign. Intensify patrolling, including night patrolling, to ensure no burning of waste, etc. The DPCC and the MoEFCC have asked for strict compliance and weekly reporting of the implementation of the above prohibitions from all implementing agencies based in Delhi NCR. The Government is also very strict on ensuring the implementation of the Hon’ble Supreme Court ruling that no fire crackers are allowed before 8 pm and after 10 pm on the Diwali night. The SHO of each division has been empowered to act against all people who violate this instruction. The Government of NCT of Delhi has been raising awareness on the harmful impacts of bursting crackers especially to the very people who are engaged in this. The Government has created and disseminated awareness material through conventional and social media for the masses. The fact that crackers contain harmful sulphur, cadmium, aluminum, which is immediately inhaled by those bursting crackers and the health impacts of inhaling each of these substances is included in this awareness material. The impact of causing hearing disability, heart diseases and blood pressure related problems due to bursting crackers are also being highlighted by the Government. The Home Department of the Government of NCT of Delhi has also highlighted that the Supreme Court has directed that for preventing air pollution, community firecracking may take place at pre-designated areas. For popularizing this practice, the Government has provided a list of such community places where this activity can be conducted after taking due permission from the local police (SDM/SHO). A list of such places is available on the website of the Delhi Government. Basically, all such places where Dussehra is celebrated have been allowed for being used for community firecracking. 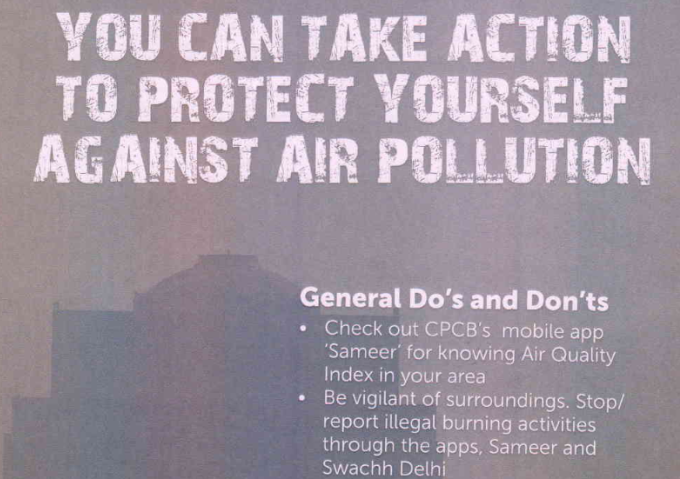 The Government has also issued General Do’s and Don’ts to be followed by every citizen so s/he can protect her/himself from air pollution related diseases. These include, urging citizens to report illegal burning of waste around them, using N99 air masks that can filter out PM2.5 particle, plant broad leaved plants indoors and plant trees in community spaces. In addition to all this, the Delhi Police has also been extremely vigilant and has seized over 3,500 kg of firecrackers and has also made considerable arrests to curb the menace of illegal sale of firecrackers. Clearly, all sections of the Government of Delhi and India have worked to ensure that Diwali 2018 is not as polluting as it needs to be. Not only this the Government is now going a step ahead and thinking of ways to induce artificial rainfall post-Diwali to improve the air quality. It is now up to the people of Delhi to respond and react and take a decision between a few seconds of joy or a degrading lungs with each burst of a firecracker. The joy of a cracker, for those who enjoy it, is very short-lived. The damage it causes to your lungs is life-long, and will become more apparent with age. The Government and all other agencies have played their part in letting you know about this. The choice is now yours, and is as simple as bouts of coughing versus a healthy life. We hope you will make the right decision. Happy Deepwali!